Corinthian University…. Sounds like Corinthian leather, doesn’t it? And Laureate… like “Poet Laureate.” The branding just reeks of class. In this post, I’ll take a look at the just-collapsed Corinthian University, and then at Laureate University, soon to issue its first successful IPO — one can only hope that second time is the charm — through the lens of Willam R. Black’s concept of accounting control fraud, which he has used so successfully to explain the looting the big banks did during the subprime crisis that preceded the Great Financial Crash of 2007-2008. I should say at once that I can’t make an iron-clad case, partly because my finance skillz are so rudimentary, and partly because Laureate, for reasons we will see, would be a tough nut for any researcher to crack. But the fact set certainly is suggestive! (1) Clearly, for-profit post-secondary education is generating considerable revenue, but to what end? (2) What does it mean when the financial objectives of a university require that income be directed to owners and investors rather than fully invested in the further development of institutional resources, programs and infrastructure? (3) Isn’t it time for public authorities to recognize that not all activities operate best when profit is the key objective and acknowledge that there are some social services that are diminished when revenue has to be diverted to profit individuals and corporations? To answer Reisberg’s rhetorical questions: (1) Because markets; (2) see #1; (3) yes . (Of course, neo-liberal infestations in universities lead to looting by administrators and cuts for everyone else, but that’s not the same as optimizing the entire institution for profit-making.) And with that, let’s look at Black’s formula for accounting control fraud, then at Corinthian, and finally Laureate and its quondam “honorary chair,” the Big Dog, Bill Clinton. Here is Black’s Formula for accounting control fraud; we might go so far as to regard it as an elite playbook. Deregulation and desupervision are more extreme in some industries and regions and certain assets provide superior “ammunition” for accounting fraud. 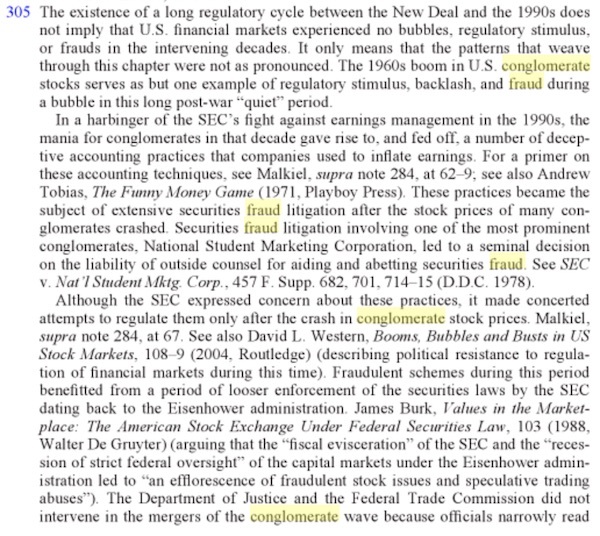 If entry is relatively easy (and it was ridiculously easy for mortgage banking and loan brokers), then accounting control frauds will cluster in particular asset categories, industries, and regions. The accounting control fraud “recipe” for a lender, or purchaser of loans, explains why this is true and why it produces the three “sure things.” The fraud recipe guarantees (1) record (albeit fictional) reported profits in the near term, (2) the controlling officers will promptly be made wealthy by modern executive compensation, and (3) and the lender (purchaser) will suffer severe losses, though it will only recognize those losses years later. Note that the lack of leverage means that the take from these frauds can’t balloon to the volume of takings in the foreclosure crisis before the bubble, and there are no bailouts, so there’s no massive upward transfer of wealth to an entire class of financiers. However, the profits would be sufficient to provide owners and administrators and the providers of professional services with a reasonable lifestyle. And the relation between the scale of the looting and the scale of damage to human lives isn’t necessarily linear. Many thousands of students were damaged by Corinthian alone, and the damage will persist through the rest of their lives. The schools will close effective Monday. They include 13 Everest College and WyoTech campuses in California, along with 12 Heald College campuses in California, Hawaii and Oregon. Corinthian will also close Everest colleges in Phoenix and Rochester, N.Y., along with an online division in Tempe, Ariz.
Like many other large for-profit schools, Corinthian nearly doubled revenue to $1.75 billion from 2007 to 2011, as the Great Recession prompted millions of unemployed workers to seek opportunity in higher education and career training. [For profit “universities”] often get at least 80 percent of their total revenue from taxpayer-funded federal student loans and grants. In 2013, Corinthian’s total revenue exceeded $1.6 billion, 84 percent of it from federal student aid. In a letter to Corinthian outlining the fine, the Education Department alleged widespread deception. In some cases, Heald paid temporary employment agencies to hire graduates in short-term jobs so they could be counted as “placements.” In other instances, Heald considered graduates “placed” in jobs they had well before they enrolled. At Heald’s Honolulu campus, staff members considered a 2011 accounting graduate to be “employed in the field” based on a food service job she had at Taco Bell since 2006. Documents also show Heald considered business administration graduates to be successfully placed working retail jobs at Safeway and Macy’s. In the US, only 10% of the undergraduate enrollment is in private for-profit universities yet these students account for 25% of federal loan dollars and 50% of the loan defaults. Unfortunately for their enrollees, many of these colleges … charge very high tuition for degrees that are essentially worthless. Many students never actually finish the degree programs, and those that do often find that their job prospects are no better than when they started—but just more urgent because of the massive load of student debt they accumulated in the process. For-profit colleges can be twice as expensive as Ivy League universities and often charge 20 times what public community colleges do for the same two-year programs. Rosalyn Harris, an unemployed single mother who had never gone to college, thought getting a degree would be the ticket to a new life. So at age 23, she enrolled in a two-year criminal justice program at for-profit [Corinthian “brand”] Everest College in Chesapeake, Va. But the wealth of job opportunities the school had touted never transpired, and all she ended up with was more than $22,000 in student loan debt. She said classes were terrible, she didn’t receive any of the training she needed, and as a result, she spent months after graduation searching for criminal justice jobs without ever getting a call back. Desperate to start paying some of her bills, Harris eventually applied for any entry-level job she could find. A full year after she graduated, she finally found a minimum wage job stocking shelves at Victoria’s Secret. Students who were bilked into taking abusive high-interest student loans out from a leading for-profit college company will get some significant relief, the Consumer Financial Protection Bureau (CFPB) announced Tuesday. A total of $480 million in debt will ultimately be forgiven under the arrangement. Publicly traded schools have been shown to have profit margins, on average, of nearly 20%. A significant portion of these taxpayer-sourced proceeds are spent on Washington lobbyists to keep regulations weak and federal money pouring in. Meanwhile, these debt factories pay their chief executive officers $7.3 million in average yearly compensation. John Sperling, architect of the for-profit model and founder of the University of Phoenix, which serves [sic] more students than the entire University of California system or all the Ivy Leagues combined, died a billionaire in August. Sweet. As you can see, for-profit universities really are “a sure thing,” just as Black suggests: (1) Recruit as many students as possible, (2) by doing whatever it takes to get them to take out student loans, (3) boost profits by jacking up the price and gutting the product, and (4) pass the bill to the Feds when the marks can’t pay off their debts because they can’t get jobs because of the lousy education you sold them. For comparison, the Apollo Group — which owns the University of Phoenix and is the largest publicly traded for-profit chain — brought in about $4.3 billion in revenue last year. However, Apollo Global, which is an internationally focused subsidiary, only accounted for $295 million of that. Indeed, in the late 1990s, when most other for-profit education companies were focused on the potential of the U.S. market, Laureate looked abroad. The Baltimore-based company, at that point a K-12 tutoring outfit known as Sylvan Learning Systems, purchased its first campus, Spain’s Universidad Europea de Madrid, in 1999, and has since affiliated with or acquired a total of 78 higher education institutions on six continents, ranging from art and design institutes to hotel management and culinary schools to technical and vocational colleges to full-fledged universities with medical schools. [Laureate] has 800,000 students, up from 243,000 seven years ago, making it America’s largest for-profit college company by enrollment. Since going private in 2007, Laureate’s annual revenue has more than tripled to $4 billion. Inside a building on a narrow Rio de Janeiro street, nine telemarketers sit in small cubicles, talking frenetically into headsets as scripts scroll across their computer screens. On an October morning, these salespeople are urging high school seniors to attend Centro Universitario IBMR, a for-profit university. Their supervisor, Rafael Morine, paces the room, straining to be heard above the clatter of an air conditioner. “Remember, today we are offering 30 percent discounts,” he tells a young woman. In 2004, then-President Luiz Inácio Lula da Silva began a program called Prouni, which offers scholarships for low-income students to attend private colleges. Since taking office in 2011, President Dilma Rousseff has expanded the program and more than quadrupled the budget for subsidized student loans under a program called Fies. The subsidized loans carry an annual interest rate of 3.4 percent — an extraordinary bargain in a country where inflation is more than 6 percent and banks often charge over 40 percent interest on personal loans — and students can wait until 18 months after graduation to begin repayment. About 5.3 million of Brazil’s seven million college students were in private institutions in 2013. Some 31 percent of them received aid from Prouni scholarships or Fies student loans or both. Laureate is also in Australia, however — but only because Australia introduced the FEE-HELP system especially for for-profits, although there is a 25% fee. FEE-HELP, quite possibly unlike Brazil’s system, is positively begging to be defrauded. [For-profit “college” Evocca] has reaped more than $130 million in federal funding last year through the controversial federal funding system called VET-FEE-HELP, where private companies get paid for every course, even if students do not complete it. Helpful, indeed! But to whom? Check the box? To be fair, no. There’s the obvious possibility of looting in Australia, but not so in Brazil, and there are 27 other countries to consider. But that doesn’t mean that Laureate loot in other ways, as we shall see in step 3. In deciding not to renew the Universidad de Las Américas’ accreditation in October, the National Accreditation Commission cited the 34,000-student university’s unsatisfactory graduation rates and its rapid enrollment growth: while the number of students rose by 36 percent over three years, the increase in instructors failed to keep pace. [Teachers, students and government officials] say Laureate boosts revenue at struggling colleges by turbocharging enrollment, often without a parallel increase in academic investment. Since Laureate took over IBMR in 2010, its quality ranking among small colleges in Brazil has dropped to 132 from 41, according to the government’s National Institute of Studies and Educational Research. Both these examples are from Latin America, where tuition seems not to be predatory. Nevertheless, check the box? I say yes. In all of the countries that host private universities there is growing concern about the quality and ethics of their activities. To date, there are more anecdotes than data, but enough of the former to be concerned. In Latin America scholars and legislators recount incidents where faculty rosters are padded with distinguished individuals who may show up periodically to give a lecture but who make rare appearances in regular classes, of judges offered nicely remunerated appointments in law schools with limited responsibility, of laboratory equipment and libraries rented for occasions when the institution is being reviewed for accreditation. In Brazil, it has been reported that students performing poorly are “retained” so as not to be eligible for the ENADE, the national exit examination given at three-year intervals and used for monitoring institutional performance. These “irregularities” make it possible for these universities to maintain legitimacy, obtain protection in the courts, and (often) achieve accreditation. In Chile and Peru, newspapers warn of close relationships between administrators and investors at for-profits with individual politicians who protect these institutions from sanctions. Chile has witnessed numerous scandals in which individuals and agencies involved in accreditation reviews received suspicious benefits from these interesting “non-profit”, for-profit universities. So it seems the bag is held differently in Latin America than it is in the United States. “We are highly leveraged,” [Laurate] reported. … Moody’s I Investor Service, the credit ratings agency, has downgraded the credit outlook for Laureate Education to negative from stable, citing the global for-profit chain’s increasingly leveraged position. Laureate, which is based in Baltimore and enrolls 800,000 students at 200 campuses around the world, has used debt to finance many of its acquisitions. The pending purchase of a Brazilian university for $500 million would bring the company’s total debt to roughly $6 billion, according to Moody’s. It seems to me that Laureate’s debt is at least in part a bet on growth in emerging economies. What happens when those economies slow down? I would bet those “distinguished individuals” with “close relationships” would be more than happy to bail out the a Laureate brand, for a “nicely remunerated appointment,” say. Check the box? No, because we have no examples; but Moody’s, bless their hearts, is watching, and so should we. Ka-ching. As you can see, Laureate has “a sure thing” available to it, just as much as Corinthian did, which can be tendentiously summarized in much the same way: (1) Recruit as many students as possible, (2) by doing whatever it takes to get them to enroll, (3) boost profits by gutting the product (and levering up? ), and (4) pass the bill to your political cronies when the marks can’t pay off their debts because they can’t get jobs because of the lousy education you sold them. The big thing about the seemingly legitimate entity when the CEO is the crook is, first, everybody reports to the CEO ultimately, right? So the CEO is the point failure mechanism where if he or she goes bad, almost everything may go bad as well. So all those things that we call internal and external controls, all report to the CEO. And the CEO therefore can, as I’ll describe, use compensation, hiring, firing, praise, and such, to produce the environment that will create allies for his fraud. The recruiting practices in that Brazilian boiler room and the crapification in Chile, Peru, and Brazil can only have been driven from the CEO level, just as at Corinthian. Clinton, as quondam Chancellor of Laureate International Universities, had the name and the clout to speak to the CEO of the Laureate conglomerate, or the President of any one of the Universities. Clinton is also famously wonky and an omnivore for information. So did he find out how Laureate was running its operations? Or was he just a figurehead? What happened to the brilliant young man who made it all the way from Hope, Arkansas to Oxford, where students have been taught since 1096 A.D., a non-profit, and therefore, like anything public, in the gunsights of sleazy private equity investment banksters everywhere? Where is that young man, Bill? Is he inside you anywhere, now? Those dreaming spires…. Will they survive in a regime of for-profit universities? How? What will you do to make that happen? Obviously, Naked Capitalism doesn’t give investment advice, and if I were any good at investment, I’d be doing it, and not what I do. However, the reckless reader could be forgiven for looking at Laureate’s forthcoming IPO with favor; after all, fraud has often made a great number of insiders filthy rich, and why not you? So, let peculation thrive! Citigroup Private Equity, S.A.C. Capital Management LLC, SPG Partners, Bregal Investments, Caisse de depot et placement du Quebec, Sterling Capital, Makena Capital, Torreal S.A. and Southern Cross Capital. The market climate surrounding for-profit education could be better. The For-Profit Education Index of 13 companies, including DeVry Education Group Inc. and Apollo Education Group Inc., has plunged 55 percent through Wednesday since its peak five years ago. Enrollment has slowed amid recruiting abuses and student debt concerns, leading to a regulatory crackdown. In the past six months, both Corinthian Colleges Inc. and Education Management Corp. were delisted from the Nasdaq Stock Market. Hopefully, KKR will lose a packet, and we as a society can get on with the job of making a tuition-free university education available to all, as does Germany. The neo-liberal justification for education is jobs, and their policy is that universities should optimize courses for job categories currently on offer (and, I would cynically hypothesize, job categories useful to the “business leaders” who are on the university’s board of trustees). But this is a case of business sabotaging industry (as Veblen would have it). Consider: A business leader for a buggy whip manufacturing concern would optimize the university for the arts of buggy whip manufacturing. They would have little use of “academic,” “pie in the sky” concepts like “horseless carriages.” Optimizing for training de-optimizes for invention. No doubt the buggy whip manufacturer would argue that “innovation” should take place in corporation labs, and so it would: More flexible whips, new styles for handles, a crackier cracking sound, and so forth. See under Big Pharma. There are two other pieces besides recruiting: The first is the role of accrediting agencies, who might remind you of appraisers in the foreclosure crisis; and the second is that Corinthian’s role as a predatory lender. I think one of the limitations of Black’s application of the concept, so far, is that all the steps in the recipe take place within a single firm, as in this post; but the steps can also be unbundled and taken on by different firms, thereby corrupting entire systems of industries. This entry was posted in Guest Post, Politics, Private equity, Privatization on April 30, 2015 by Lambert Strether. If you want to understand what Bill Clinton received from his role in Laureate, all you have to do is look at the Donors to the Clinton Global Initiative and then look at the Department of State mentions of Laureate. It seems reasonable to consider, that in return for large donations to CGI, the company was able to gain the patina of legitimacy of the Secretary of the Department of State. “To further these goals, the Office of Global Youth Issues is launching the Startup Youth Initiative for young entrepreneurs. As this post is about education, I wondered if anyone is paying attention to the attacks on City College in San Francisco? Real estate developers are trying to get their hands on the property owned by the college while the college fields threats on its accreditation for trying to serve a diverse community. Good reminder, thank you. Sort of like Cooper Union, on the West Coast? And Sweet Briar College near Lynchburg, VA. That one seems to be the kind of inverted trust-busting that we see these days, like the Barnes Foundation art collection and of course also Cooper Union. The alumnae have a site that includes updates and a media page: Saving Sweet Briar. In March of this year, the board of trustees announced the closing of the college as of this coming August, despite the presence of an endowment of around $90 million including its campus of 3200 acres of prime horse country land, and the lack of acknowledgement of a financial problem and co-ordination of efforts to meet it. Altogether quite intriguing. How much of the for-profit activity is a meta-shell game played on supporters? One [shell] reason proffered for the rise in for-profits is that conventional education was being subverted by [fill in blank here for demon-du-jour: commies, pinkos, lefties, righties, centries, godless heathens…]. That could instigate an outpouring of scorn, fear and various other emotions enough to get the first customers in the door. Combine that with Black’s model that you outline above, and wait for the results. Meanwhile, there is a business [shell] case to be made for investors. There is a market ripe for development, in part to some adept lobbying on the screaming need for more education to [fill in another blank here: rise of China, imminent decline of the west, offshoring, creative destruction, just because…] and don’t let those sketchy students go BK on us, either, and the best part is that the Feds, meaning those ever-suffering little-people taxpayers will subsidize it. Talk about your risk transfer opportunities! The shells aren’t walnut shells, they are shell casings. Rinse, or shuffle the cards or shells, and repeat. Dem wit ears to hear, let ’em hear…but I don’t think the target audience for the shell casings you so admirably describe are likely to frequent haunts like NC, or anywhere else where they are likely to have their notions challenged. After a while, she bucked up and did what almost all liberal arts students must do eventually — she started looking for jobs outside of her field. She decided that substitute teaching might be a good stepping stone to figuring out where to go next, but when she applied with the local school district, she hit a completely different snag: Her degree was worthless. Not even just “BA in broadcasting” worthless — it was as if she’d never gone to college at all. No one ever went broke over-estimating the gullibility of the human race…. Or maybe the first customers just got in the door for less ideological reasons and more like the school easily fit with working a (or two or more) jobs while going to school which traditional education has done @#$# all to accommodate (plus they were probably unsophisticated about what they were getting into – like all those people who took out bad home loans). It doesn’t mean they didn’t get had but yea people may not like commies but a lot more people are exhausted by survival and then trying to get ahead in the world, than are worried about commies under every bed. Christian colleges might be ideological but most for profits are selling job training. Good stuff! But there is a little Corinthian in every school. Even UC Berkeley inflates and incorrectly reports starting salaries. Most tertiary institutions, whether public or private, inflate a lot of numbers, especially those who gain employment following graduation. There have been notable inflations of info about gaining jobs after obtaining a law degree, for example, and same inflationary & rather false info is provided as much by the Ivies as by other schools. There have been a lot of articles and radio stories about how the private schools, in particular, engage in predatory tactics with Vets, who end spending Uncle Sam’s (ie, your and my tax dollar$) on pretty much useless degrees. It’s taken some time for “something” to be done to inform Vets about what programs to avoid. Why? Because predators like Corinthian are in on the “fix” to encourage Vets to attend their worthless programs – CHA CHING CHA CHING. It’s all pretty disgusting. And YOU and I get to pay these frauds, including the Big Dawg – as IF he needs more money! Every time someone praises WJC I want to puke. …let me assure you. While Cal (Berkeley) has it’s faults, being anywhere near the corruption of For Profit Colleges is not one of them. You read a lot about liberal arts grads and maybe it’s spreading made into permanent adjuncts, who are always promised it will lead somewhere and it never does. The education is usually good. The job prospects especially at the university not so much so, just an endless stringing people along. BTW I know this was happening in Berkley over 50 years ago even, this stringing along. Things have not gotten better. Lived in Germany for 22 years. Everyone who applies for a free German university education is NOT automatically accepted. Extremely competitive to be accepted. Thanks for the info, since it’s hard to get good information about other countries in this one, oddly enough. Still, there’s a chance, eh? I notice in the last cite that selective deregulation started in the Eisenhower administration. Harry Truman freaked out over the recession of 1948 and post-haste sent us off to Korea. I assume this stabilized the economy. Eisenhower, who hated war, ended Korea and was ringside to watch the economy fall apart. This should tell us more than a few things because we are still dependent on an overproduction somewhere in the economy in order to keep it going. It shouldn’t be war. It should be the remediation of the environment. And free, high-quality education for all. War is the absolute craziest thing about “humanity”. For sure some clever entrepreneur is going to start a whole new and very open industry: for profit war. Why not just cut to the chase? Yes, you can automate a population with bread and circuses, and cut the counterweight at will, but why would you set the reference voltage to human stupidity, arbitrary legal doctrine? The critters began with the US Constitution, and went backwards, increasing the efficiency of natural resource exploitation, calling it GDP, the common good. Your referenced voltage for regeneration depends upon the spacetime you want to visit. Public education doesn’t get dumber every year by accident. G is pulling way too many amps for whatever residual labor remains in its economy. The result is no spin globally and over-spin locally. Net, the timing is off and insufficient to turn the motor in any case, getting worse, priming a dead pump. Like football, the market is just another circus, with less and less bread coming in, replacing it with inflation. Pensions are pay you go, because the critters always piss away the surplus, as a means of extortion. Print, drop interest rates negative, and eliminate cash as you like. BAS/Maglev is just elevators with dumber motors, because proprietary equipment not only doesn’t work, but also fails quicker every year, creating parabolic costs, because the critters are too stupid to turn off the lights, and carbon tax addresses the symptom, growing the problem of density by ignoring it. If you think something is going on in that Tower that labor doesn’t know about and ignores, you are only fooling yourself. I just talked to guy the other day who wanted to talk about cranes, certification and licenses, being paid by the State not to work, collecting rents with the proceeds, and looking for commodity labor, complaining about it. Labor isn’t a commodity protesting in the street, but the middle class is welcome to presume it is. Whether something is a motor or a generator, a weight or a counterweight, in the pendulum of time, is a matter of perspective, which is programmed in most, of their own free will, which they pledge to empire. Drop the tool in your hand, and pick up the tool necessary to do the necessary work, or get out of the way for someone who already has. There is never a shortage of capital, printing to infinity, to be transformed. The work is building the bridge. Any automaton herd can do what it is told, by its revolving scapegoats, what it did yesterday more efficiently today, calling it progress, complaining about being a commodity, eating crap and watching Internet TV, expecting a different result than war, with itself. Control, knowledge, is not power. It’s discharge, with inflation and nowhere to go but self-absorption, which is why it blows up, which is neither here nor there to the universe, empire psychology riding a Bell Curve in a circle. No one forced anyone to move those factories to China, buy the resulting crap, or except the money printed at a premium accordingly, to maintain control over inflated real estate as the dead weight. Europe’s welfare production isn’t any better today than it was before WWII. The moneychangers see labor as a cost to be capitalized with technology, which is why they don’t see the exponential cost of banking, replacing work with make-work. It helps to have a counterweight ready, before blowing up the existing, with globalization, but if all you know is extortion…because the State herd couldn’t see labor’s response does not mean that labor did not respond. Whether the critters hook up to my elevator or not, it’s going to be badness, and they throw a tantrum because I won’t show them how to do it. All grounds are not created equal, and you might want to rethink bonding, especially at the transformers. What makes me different from most everyone else is that I started working at age 5, wiring radio and TV stations, the beginning of global mass media, financial fraud scaled to infinity, for my 53-yr-old father, who learned his lessons in the Great Depression. Labor doesn’t change with artificial volatility in the middle class. Have you tried applying this analysis to Rocketship charter schools? I’d be interested in seeing the result. If you really need to profess shock that a Clinton is cashing in on something shady. . . least of all the increasing cannibalization of the public sector (education) by business, let’s just say that your political education is decades in arrears.